Medical Camp Team including volunteers,Hotel owner Miss Sharkhando. 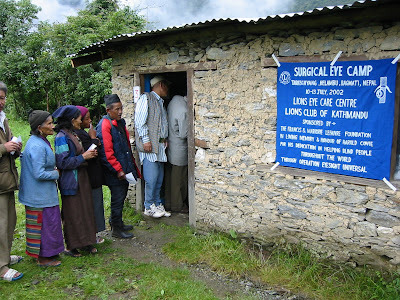 On July 9th, 2002 a team of 10 from Nepal and North America headed off towards Tarkeyghyang a region in Helambu to conduct a 3-day eye camp.Which is organized by Kunsang Sherpa Hyolmo with the help of Dr.Yanta Mani Pradhan . Our medical camp was successes with great help of Dr.Pradhan and and other volunteers.We drove for about 5 hours to our main starting point of our trek along the Melamchi River. We had intended to reach the midpoint to Tarkeyghyang by the end of the first day; however, because we left Kathmandu late we were not able to get where we wanted to be that first night. The next morning we headed off to Tarkeyghyang, up, up, and up. It rained the whole way up, allowing for all the leeches to come and fest on us all. By the time we all made it to Tarkeyghyang we were very exhausted. We decided to start the camp the next day as we had reached the village much later then expected.The eye and general medicine camp began July 11th, bright and early. As volunteers we helped where ever we could. Irminne , Anu and I screened all the patients for general vision imparities, as well as blood pressure and heart rate. Human, Nerpa and Dunbardor further screened the patients for glasses and other eye aliments. Dr. Kishore (he likes to be called Kish) waited anxiously for potential cataract patients along with his trusted nurse Rameta. 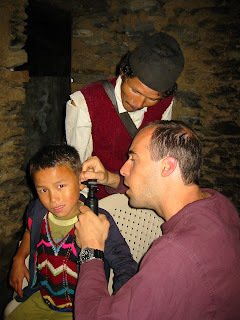 Dr. Matt Brodsky and I did translation and started seeing the general patients. While Irene started with registering the patients and later she helped Dr. Matt (her husband) as his translator I helped other surrounding and registering . 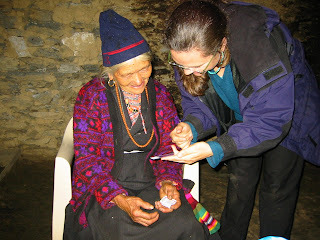 It was great that Irene had lived in Nepal for many years and was fluent in Nepali.Before medical camp begin I did all management .At first I went to Hyolmo villages and surrounding village to inform people regarding medical camp.It took me nine days to inform since I have to walk each and every villages. Dr. Pradhan informed me that he'll inform it from national radio as well. 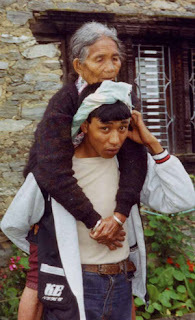 One boy carried his grandmother who had been blind in both eyes for 3 months on his back for 2 days to get her eyes checked. Kish along with Rameta and Nerpa removed both cataracts from her eyes. It was a sight to see her the next morning when the bandages came off; she was so excited to see again. In her own words (in Nepali) “I am so gritty, I can see again”. It did not hit me till then what an important impact these camps are for such small and remote villages. Our job was made more difficult by the complete lack of facilities at our disposal. We had carried a small supply of basic medicines with us, but otherwise the nearest pharmacy was a day’s walk away. This meant that anything that could not be diagnosed by a simple history and clinical examination or treated by our limited pharmacopoeia had to be referred to diagnose and treat the most common complaints (gastritis, diarrhea, aches and pains and blood pressure), but any more serious concerns had to be sent away with a letter in hopes they would make the trip to the nearest town with a hospital to be checked out. We had to ration medicines over the two days. All cataract surgeries were conducted in a-make-shift operating room at the hotel we were staying at. All operations were done under local anesthetic, which meant that the patients were awake throughout the procedure. I would like to thank Dr. Y. Pradhan for allowing me the opportunity to spend some time at the Lions Eye Care Center and giving me the opportunity to travel with eye camp team to Hyolmo Tarkeyghyang and other places. As an individual with limited medical background it was a great opportunity to learn so much as well being able to help all those people. The Lions Eye Care Center of Kathmandu hosts many eye camps all over Nepal, please if you can help them in any with donations of medical supplies, glasses, funds as well your time. It was always my dream to do volunteer and help poor and needy people specially handicraft,deaf, blind people. My brother Dawa became deaf due to lack of medical attention . We are born in remote area of Nepal place called Hyolmo. There were no medical facilities at that time and till now one health post has been established but that is also too far .I still remember my brother who fell down from the roof and there were no any doctors. We noticed that he was fine and fit.But we didn't know that he got injured inside and he lost his hearing power.After that he couldn't speak as well.After many year we also notice that pus is coming out from his ear due to ear infection.We admit him biggest hospital in Kathmandu, Nepal and did operation with the help of Dr.Yanta Mani Pradhan and Irene Taylor Brodsky but still we are helpless. There are so many rare cases in remote part of Nepal.I realized that I was surrounded by people who have more obstacles than I do and also realizes there is nothing standing in my way. 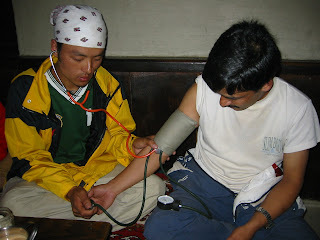 So my aim to became social work who can help poor and needy people of Nepal.There are so many places where there is no doctors or hospitals even small health Post. It will be great if you can help with those people as well. Statistics: Day 1 and Day 2 130 patients (eye and general) 18 glasses give 3 cataract surgeries 15 minor surgeries 60 eye medications General concerns – migraines, blood pressure, diarrhea, gastritis, chest pain, nausea vomiting, ear infection, arthritis and facial twitch – various medicines given to all patients if required Male = Female Ratio Most patients over 25 years of age 95 patients (eye and general) 49 glasses given 3 cataract surgeries 35 eye medication and rest general check up... General concerns – migraines, blood pressure, diarrhea, gastritis, chest pain, nausea vomiting, ear infection, arthritis, worms, and downs syndrome – various medicines given to all patients if required Male = Female Ratio Most patients over 25 years of age. MedDocs Publishers is a very well-dedicated in publishing various informative medical journals and EBooks like clinical journals, peer reviewed articles. We follow open access policies.